Have you ever started out on a journey, traveled a great distance and then ended up at your destination with little recollection of the trip in between? If you have then you have not entered the Twilight Zone. 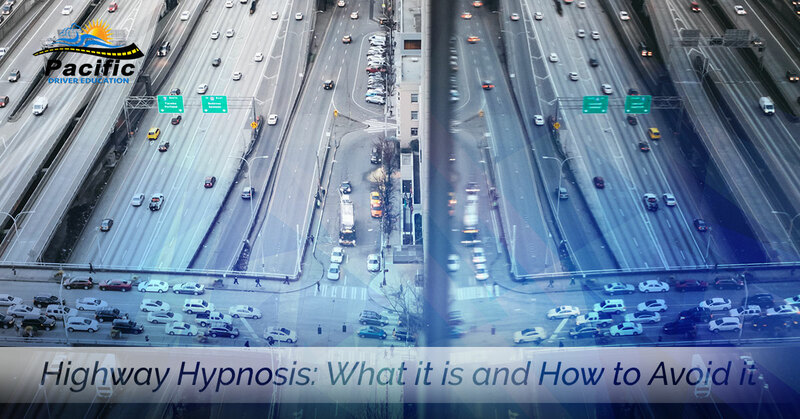 You are in instead likely to have undergone a phenomenon called “highway hypnosis.” Highway hypnosis (or white line fever) is a trance-like mental condition that some people undergo after having traveled great distances. It is brought upon by the monotony of the road. Obviously, this creates a hazard for the all motorists including those who are paying attention to their environment. At Pacific Driver Education, where you can learn to drive in Beaverton, Oregon, we would like to give you the following tips to avoid this hazardous state. Listen to music: Turning up the volume on the radio and playing some lively music is an excellent way to stay awake and entertained for long distance trips. Be sure not to listen to music that might tend to lull you to sleep such as classical music or smooth jazz. Keep your eyes active: Highway hypnosis is not called “white line fever” for no reason. Gazing at the dividing line on the road can gently lull you to sleep. Try refocusing your attention to other areas of the road such as landmarks, etc., while you drive. Take driving breaks: Make it a point on long distance trips to stop every few hours, get out of the car and walk around, stretch, etc. This will not only help you to regain your focus but it will also help prevent cramping and improve your circulation. Get a Good Night’s Sleep: A well-rested driver is an alert driver. Getting a good night’s sleep is particularly important when embarking on long journeys. Try to get to bed early and get at least 7 hours of sleep. Turn down the temperature: Excessively warm environments have the tendency to make most people drowsy. When driving you should be comfortable but not too cozy. Try turning up the AC on long summer trips. Take a catnap: If you find yourself about to drift off, pull over someplace safe and take a quick nap. If a quick nap won’t do, consider checking into a motel and getting a longer rest. Arriving at your destination a little late is better than not getting there at all. According to a 2013 study by the National Highway Traffic Safety Administration (NHTSA), more than 100,000 crashes a year, resulting in 1,550 deaths, are a result of drowsy driving or highway hypnosis. Fortunately, there are ways to stay alert when you are driving down the road and begin to feel drowsy. Learning these ways and others will keep you focused and ready to react to any emergency that may occur. As you ask yourself who can “teach me to drive Portland Oregon,” consider our experts who can help you learn other ways to make driving safer for you and your passengers.